Exile is whatever you make it. It's a mod of a game that you can add other mods on top of to create any gaming experience you want. No, its not. Exile has a clear theme and in no way includes zombies, adding zombies to it makes it something else entirely. But that's not the point. 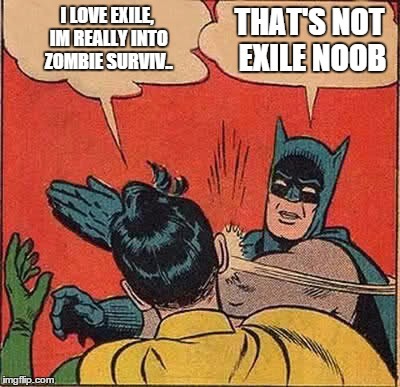 the point of this meme was to highlight that your average player thinks of Exile to be a zombie survival mod due to the obvious fame its gathered via Frankie/Sada. lighten up Cen... lighten up. Cen likes to take thinga a little too serious! Center likes to take thinga a little too serious! That's my opinion as well. Thanks to Arma 3's open nature you can add any mod to any mod and change the look and feel of nearly anything. BUT....just because you CAN doesn't mean that you SHOULD. I'm all for someone making a DayZ-ish mod clone in A3 (Breaking Point doesn't count), but doing it on the back of Exile isn't the proper way. I was just using said stick for poking too. Stop poking me, it hurts! Honestly, you can blame Maca/Frankie for that thinking. All it took was one video, and the mentality of players has shifted.